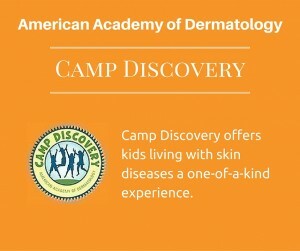 Solano Dermatology made a gift to the American Academy of Dermatology’s Camp Discovery to help send 350 kids with skin diseases to camp this summer. 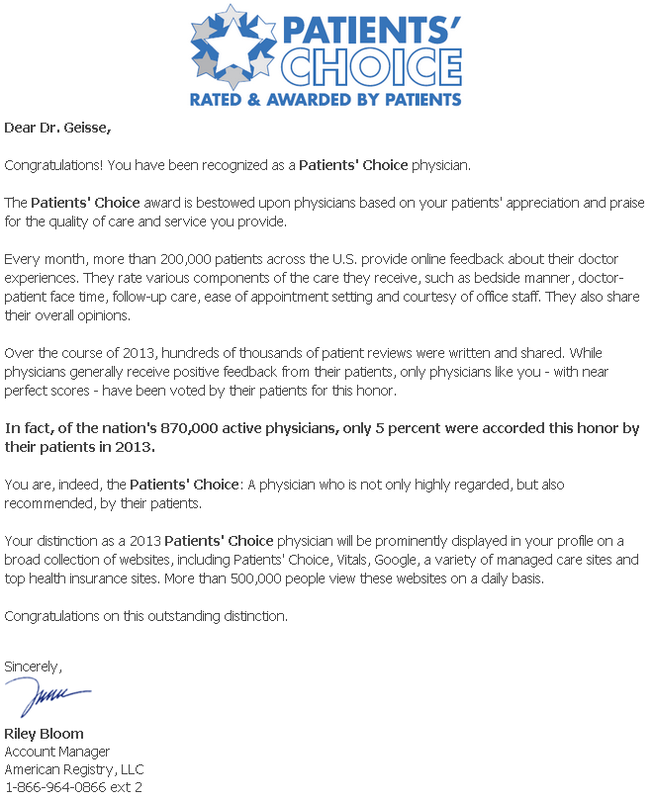 Dr. Geisse was awarded the Patients’ Choice Award! 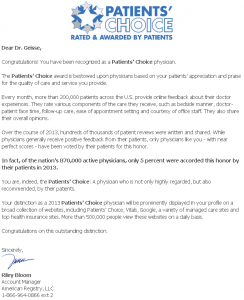 The Patients’ Choice award is bestowed upon physicians based on your patients’ appreciation and praise for the quality of care and service you provide. Every month, more than 200,000 patients across the U.S. provide online feedback about their doctor experiences. They rate various components of the care they receive, such as bedside manner, doctor-patient face time, follow-up care, ease of appointment setting and courtesy of office staff. They also share their overall opinions. Over the course of 2013, hundreds of thousands of patient reviews were written and shared. While physicians generally receive positive feedback from their patients, only physicians like you – with near perfect scores – have been voted by their patients for this honor. In fact, of the nation’s 870,000 active physicians, only 5 percent were accorded this honor by their patients in 2013. Squamous cell carcinoma is the second most common skin cancer and is increasing at an alarming rate, particularly in the elderly. Squamous cell carcinoma without question is related directly to sun exposure and also to age. The more sun and sunburns you have had and the longer you live the higher your risk of developing squamous cell carcinoma. They often come from precancerous lesions called actinic or solar keratoses which fair-haired, fair-eyed patients suffer from who have had sunburns as a child and have had chronic sun exposure. These red, raw, itchy, sometimes tender scaly spots on the scalp, face, ears, back of the hands and arms can convert to squamous cell carcinoma. Squamous cell carcinoma can also develop on its own and grow rapidly often fooling patients thinking they are bug bites, boils or infected hairs. These types of squamous cell carcinomas can be dangerous; they present as a nodule that hurts, grow rapidly and have between a 5%-25% risk of spreading or becoming metastatic depending on their depth of invasion and location. Metastatic squamous cell carcinoma can be lethal and requires aggressive surgery by our head and neck surgical colleagues. This most often happens when squamous cell carcinoma occurs on the scalp, ears, or lips. Squamous cell carcinoma in these areas would usually spread first to the lymph nodes of the neck or in front of or behind the ear. The goal in treating all skin cancers is to treat them early before they become dangerous and that is particularly true of squamous cell carcinoma because if they are not very deeply invasive the risk of them spreading is probably close to zero. There are superficial forms of squamous cell carcinoma which are called in situ or Bowen’s disease (SCC in situ). There is a specialized form of squamous cell carcinoma in situ that can occur on the genitalia called Bowenoid papulosis which is induced by the wart virus, not by sun exposure. Just as in superficial forms of basal cell carcinoma, superficial squamous cell carcinoma can be treated with the scraping and burning procedure (curettage and electrodesiccation), excision or sometimes Aldara or imiquimod. Aldara or imiquimod has not been studied nearly as thoroughly for superficial squamous cell carcinoma as it has for basal cell carcinoma. Aldara’s cure rates for SCC in situ are supposed to be 80% based upon less reliable studies. We have seen a number of cases of squamous cell carcinoma in situ that have failed rather spectacularly from superficial treatment with Aldara or Efudex, which is called 5-fluorouracil. Solano Dermatology Associates does not recommend Efudex or 5-fluorouracil for cancers, only for the precancerous lesions called actinic keratoses despite its use by other practices for cancer. We do not recommend Efudex because its use is actually quite weak when compared to even the limited research done using Aldara for skin cancer. Aldara for squamous cell carcinoma in situ causes a severe reaction and it needs to be continued for ten weeks thus it is, just as is with basal cell carcinoma, infrequently used. For very large areas that have been resistant to superficial forms of treatment we will perform wide excision or Mohs micrographic surgery. This superficial form of squamous cell carcinoma is becoming alarmingly common and is actually difficult to treat adequately without significant surgery, particularly in hair bearing skin. It is always problematic to recommend aggressive surgery for a non-invasive, not very dangerous cancer but these can become very large and eventually invasive and need to be treated properly to avoid a much worse procedure down the road when it can become many times the size it was early on. Invasive squamous cell carcinoma can be quite dangerous particularly if it is over 2 mm in depth or involves the muscle, the lip, the cartilage of the ear, or down to the bone of the scalp. Patients who have suppressed immune systems, such as transplant patients on drugs to keep their transplant healthy, patients with leukemias and lymphomas, and HIV infected patients who are immunosuppressed can get virulent forms of squamous cell carcinoma that can become metastatic and are often difficult to manage. These patients who have problems with their immune systems need to have their squamous cell carcinomas managed promptly and completely. For squamous cell carcinomas of the face, full-thickness excision down to the fat and a layered closure is the treatment of choice. Mohs micrographic surgery can be used for squamous cell carcinomas of the central face, scalp or on the shins where they are increasingly common. Mohs is quite useful on areas like the shins and scalp because we can keep the wound smaller and allow a direct or primary closure as opposed to taking skin in from somewhere else as a skin graft, which is frequently needed for regular surgery in these areas because regular surgery takes larger margins. We try to avoid skin grafts which create a second wound and take a long time to heal particularly when over bone of the skull or over the tight, often swollen skin of the shins. There is some evidence that Vitamin D3 deficiency might accelerate the growth of squamous cell carcinoma which might explain partly why elderly patients, even those in nursing homes who are getting no sun exposure, are developing these cancers at an alarming rate and are sometimes not being managed until they are quite aggressive. Any patient who has skin cancer, who then stays out of the direct sunlight as much as possible with hats, clothing and sunscreen should be taking Vitamin D3. We recommend 4,000-5,000 unites per day. If you have Vitamin D deficiency and are followed by your regular doctor then he or she should manage your Vitamin D dosage. Basal cell carcinoma is the most common skin cancer. There are millions of these every year in this country alone, much less worldwide. They are usually not very dangerous although they can be quite invasive, destructive and disfiguring. Most of these occur on the face but they can occur anywhere, even in areas where the sun does not shine. Most patients who get basal cell carcinoma have had sunburns, but they also have a genetic predisposition. There may be other co-factors that are not well understood at this time that are contributing to the epidemic of skin cancer. The treatment of basal cell carcinoma partly hinges upon the pathology. Basal cell carcinoma has different pathologic subtypes grouped into non-aggressive and aggressive forms. Non-aggressive or circumscribed basal cell carcinoma includes the nodular and superficial types. These can occur anywhere but they are common on the trunk. The most common treatment for these low-risk, less aggressive basal cell carcinomas is an ablative procedure call curettage and electrodessication. Non-aggressive basal cell cancers are soft and mushy compared to normal skin. An experienced clinician can use a semi-sharp circular spoon-like tool called a curette to scoop out the obvious cancer, leaving behind normal skin. This is often, but not always, followed by a burning procedure called electrodessication to obtain an extra margin of safety. For the worst types of non-aggressive basal cell carcinomas the curettage followed by electrodesiccation is done three times. For the least aggressive types, such as superficial basal cell carcinoma on the trunk, sometimes curettage alone is adequate without using the burning which allows these to heal with better scars. These can also be removed with excisional surgery where the affected areas are cut out and then sewn in a layered fashion with absorbable sutures underneath the skin and some sort of stitching in the skin. There are some non-surgical treatments for these non-aggressive basal cell carcinomas, primarily Aldara or imiquimod cream. Dr. Geisse authored the two major papers that led to the approval of Aldara or imiquimod cream to treat basal cell carcinomas in the United States. He was the principal investigator for 3M Pharmaceuticals who at that time owned the drug and sponsored the large double blind placebo controlled studies to get it approved. Drs. Beutner and Geisse did the very first study proving that this cream would work for basal cell carcinoma, which led to the larger studies, mentioned above. Despite Solano Dermatology Associates’ long history with Aldara or imiquimod, it is in fact rarely used for basal cell carcinoma. It is costly and creates a significant rash and has to be used for six weeks and only yields an 80% cure rate for small superficial basal cell carcinomas of the trunk. That compares to 90% cure rates for curettage and electrodesiccation or excision and thus, unless there is an extremely apprehensive patient who does not want surgery or the cancer is in an area where any scar would be emotionally devastating (such as on the central chest in a young woman), Aldara is not often used to treat basal cell carcinoma. Mohs micrographic surgery is the treatment of choice for central facial tumors including so-called non-aggressive or circumscribed tumors. Mohs micrographic surgery, explained elsewhere, provides 98-99% certainly of removal; thus if the cancers are located on the nose, ears, lips or close to the eyes using lesser forms of surgery would not be in the patient’s best interest. The worst cases the Mohs surgeon sees are often the ones that have been previously incompletely removed by lesser forms of treatment. Sometimes many years can go by before incompletely treated basal cell carcinomas show up around or underneath the scar. By that time patients can lose their entire noses, eyelids and ears to this sometimes-destructive cancer. Aggressive or non-circumscribed forms of basal cell carcinoma include infiltrative, micronodular and sclerosing or morpheaform basal cell carcinomas. These variants of basal cell carcinoma are usually on the central face and can be much larger than they appear from the surface. They often have what is called “subclinical extension”. What that means is that the cancer has branches and roots that go out well beyond the small area that may be visible on the surface. These cancers are often incompletely removed by regular forms of surgery, thus Mohs micrographic surgery is the treatment of choice for these more aggressive cancers, particularly on that face. Wide and aggressive excision can be done on the trunk for aggressive basal cell carcinoma without doing Mohs since the scar is not as noticeable or as concerning to the patient and there is usually enough extra skin to close even large wounds. Radiation therapy is rarely used for the treatment of basal cell carcinoma. It is expensive, requires multiple trips to the radiation oncologist and has some significant short term and more importantly long term side effects. The side effects include short term redness, swelling and sometimes bleeding and open areas of skin in the area that has been treated with radiation. Long term scarring and dilated blood vessels can occur and rarely second malignancies can occur in irradiated skin many years later. Around the eyes, nose or the glands of the face radiation can cause quite severe side effects such as dryness of the nose, bloody noses, dry eyes, loss of vision and loss of saliva formation from the parotid gland, which is the major gland in the cheek that forms saliva. Solano Dermatology Associates rarely recommends radiation therapy and usually only for terrible cases where the surgery would be disfiguring in an elderly patient as a form of palliation, which means we shrink the tumor and keep it from bleeding or leaking on their beds, but do not necessarily cure it since these are slow growing cancers as a rule. Rarely, when basal cell cancers are deeply invasive or involve nerves, we use radiation after Mohs surgery to help ensure it does not return. If these cancers are large and deep on the face and involve the nerves of the face and if they are not completely removed they can lead to invasion of the brain through the cranial nerves. Radiation therapy as primary treatment of basal cell carcinoma providers somewhat over 90% cure rates, based upon fairly limited studies when compared to Mohs micrographic surgery which has a great deal of data to support its use and confirm its much higher cure rate. Psoriasis is one of the most common skin problems (1 to 3 percent of people), and often appears as pink to red inflamed areas of overgrown skin, topped with white scale. These areas classically include knees and elbows but also often affect the hands, feet, scalp, underarms, groin or any other part of the body. Sometimes it may present as isolated severe dandruff. Psoriasis is an ongoing problem which may have periods of spontaneous remissions and recurrence. Many people notice their skin has seasonal flares. Although many patients report that another family member has psoriasis, most patients do not have anyone in the family with psoriasis. Psoriasis can affect the joints, known as psoriatic arthritis. This may present as pain, swelling and joint stiffness. Untreated psoriatic arthritis can lead to irreversible destruction of the joints. All of our providers are knowledgeable and experienced in the treating psoriasis. We provide a range of therapeutic options from the gold standard treatments such as topical corticosteroids and light therapy to the newer treatments that may include excimer laser therapy or biologic therapy (injectable medications) for psoriasis. Some psoriasis responds readily to therapy, other patients may have to try many treatments before finding one that provides them optimal skin clearance. Rest assured: there are many treatment options out there and even more being developed. We will find one that works for you! Dr. Geisse honors dozens of dermatologists and primary care physicians by donating in their behalf to the American Academy of Dermatology (AAD) Sustaining Fund. With more than 90% of all the individual donors to the Sustaining Fund coming from Dr. Geisse’s contribution, you can see how truly generous Solano Dermatology Associates and Dr. Geisse are. The donations were made in support of AAD programs. See the full list of Tribute Honorees. If you have ever had a skin cancer you may relate to this video. Share this link with a teenager, and help prevent Malignant Melanoma. 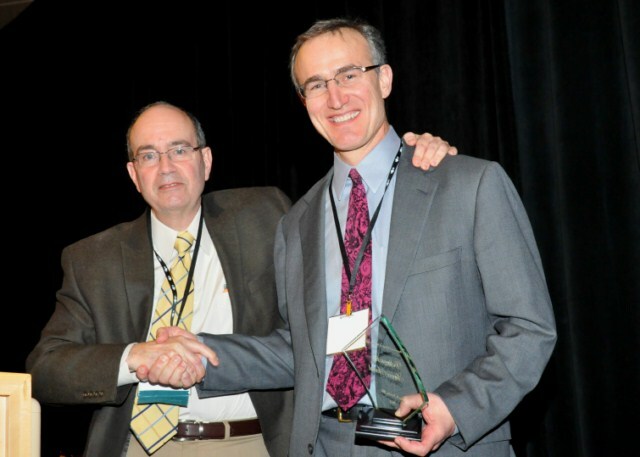 Dr. Geisse was awarded the American College of Mohs Surgery’s Distinguished Service Award for 2011. The award was presented at the annual National ACMS meeting, and was presented by Dr. Dzubow. Solano Dermatology has the XTRAC Laser which can be used for Psoriasis and other conditions. See the video on the Doctors Show to learn more about this new and exciting technology.